The ELI Group Leadership Lab for Women is a development program designed to build leadership capability, enhance professional influence, and foster accountability for behavior change. 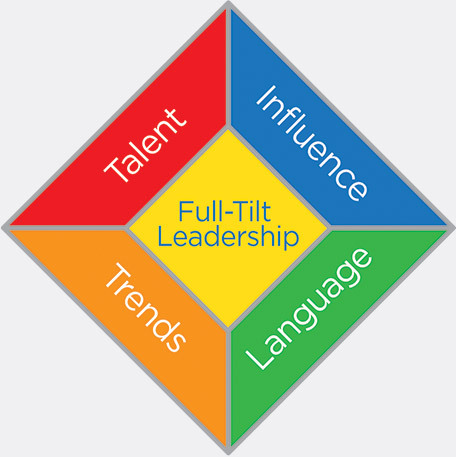 The Leadership Lab is built on our exclusive Full-TILT™ Leadership Model that focuses on four distinct areas: Talent, Influence, Language and Trends. Through interactive workshop-based learning and one-on-one coaching, we provide senior-level women with relevant skills and practical tools to help set them up for success. Each Lab has a select group of 10-to-12 female leaders from a variety of organizations who remain together for the program year. This creates an ideal peer-mentoring group focused on strategic leadership issues. Over the course of the year, the group develops a unique comradery for sharing challenges and best practices while gaining a deeper understanding of each other and themselves. To ensure long-term leadership development, participants are eligible for inclusion in Professional Opportunities for Development (POD) sessions, which is a development opportunity for all Leadership Lab alumnae.